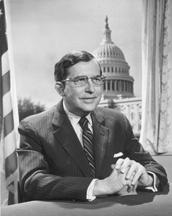 SPONG, William Belser, Jr., a Senator from Virginia; born in Portsmouth, Va., September 29, 1920; attended the public schools of Portsmouth, Va.; attended Hampden-Sydney College, University of Virginia, and University of Edinburgh, Scotland; studied law; served in the Army Air Corps, Eighth Air Force 1942-1945; admitted to the bar in 1947 and commenced the practice of law in Portsmouth, Va.; lecturer in law and government, College of William and Mary, 1948-1949; member, State house of delegates 1954-1955; member, State senate 1956-1966; chairman of the Virginia Commission on Public Education 1958-1962; elected as a Democrat to the United States Senate in 1966, for the six-year term commencing January 3, 1967; subsequently appointed by the Governor, December 31, 1966, to fill the vacancy caused by the resignation of A. Willis Robertson for the term ending January 3, 1967; served from December 31, 1966, to January 3, 1973; unsuccessful candidate for reelection in 1972; lawyer; law professor and dean, Marshall-Whyte School of Law, College of William and Mary 1976-1985; appointed interim president, Old Dominion University, 1988; was a resident of Portsmouth, Va., until his death on October 8, 1997; interment at University of Virginia Cemetery, Charlottesville. Spong, William B., Jr. A Man for Today: A Collection of Speeches by William B. Spong, Jr., United States Senator from Virginia. n.p., 1971; Spong, William B., Jr. Can Balance Be Restored in the Constitutional War Powers of the President and Congress." University of Richmond Law Review 6 (Fall 1971): 1-31.